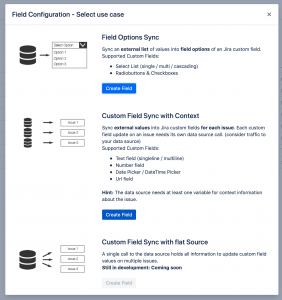 Easily synchronize external data into Jira custom fields with multiple data sources and issue based field configuration. 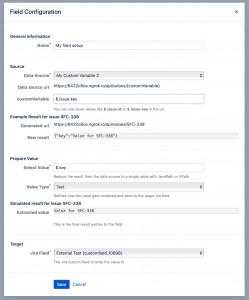 This is the documentation for the Atlassian Jira app External Data for Jira Fields. In the menu on the left side, navigate to “Find new apps” under the “Apps” category. 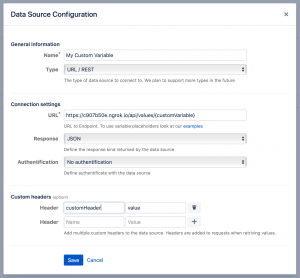 Search for “External Data”, wait until the entry “External Data for Jira Fields” is shown and proceed to “Install” the add-on. After having installed the app from the Atlassian Marketplace, you can start using it right away! Start adding a new data source by clicking the “add data source” button. This will open the following dialog. Define custom headers as needed to individualise the requests send to the data source. Those custom headers will be send with every request to the data source. After creating a data source you can verify that the connection can be established. 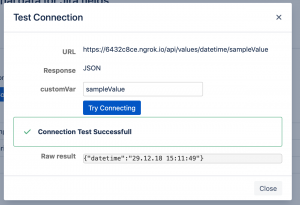 After clicking on “Test connection” of the data source you want to test a dialog appears. Here you can fill in some sample data for your previously defined variables and start the test. You get a immediate response about the success of the test and the response returned by the url. This section shows you all allowed Jira custom fields already available in your system. If you have already a custom field you want to use just skip this step. Create a new custom field by clicking on “Add custom field”. This opens a dialog where you can set the name, description and the type of the custom field. When adding a field you can select between different use cases. After selecting the datasource the simuation start and shows you the raw result of your data source to work with. The Result Type for field options sync can be one of the following. Use “List” if you want a synchronise a simple list of string values with your Jira custom field. Select Result: Now you can transform your raw result into a list of values. You can use filter and selection mechanics of Xpath or JsonPath. JsonPath.com is a great helper tool to get more complicated transformations done. If you want your string values to be mapped to a unique ID choose “Dictionry” as “Result Type”. Select the custom field of your choice. Only allowed fields for field options synchronisation are visible in this step. 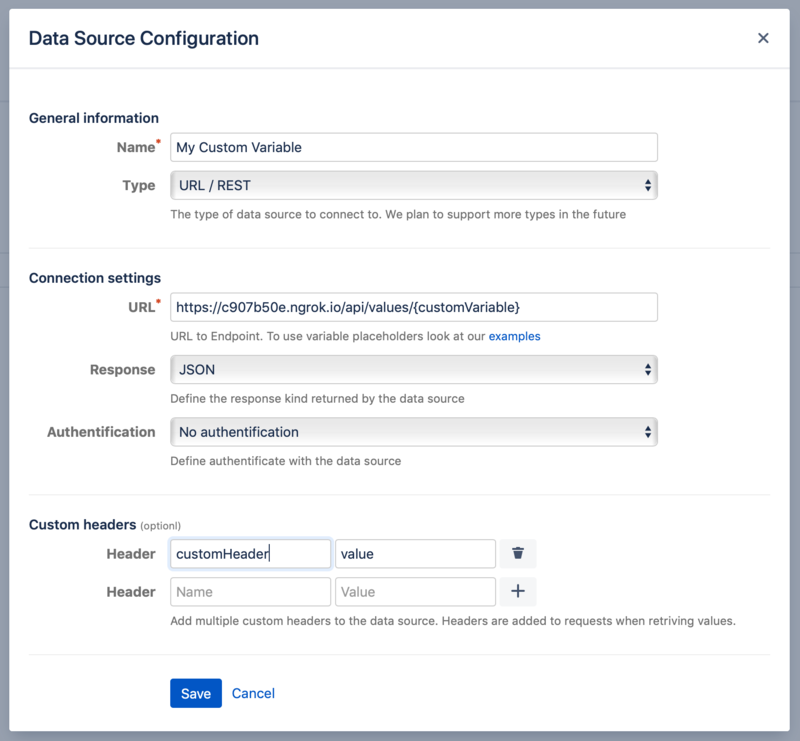 The field configuration defines which data from which data source gets into your Jira custom fields. After selecting the datasource you see all available variables created in the data source creation step. After filling out the data source values you see the result generated by your datasource. The Value Type defines what kind of Data you are using. To insert only part of the JSON result you have to select which part of the JSON should be inserted. You can use the JSONPath Syntax to solve this. In the example above the right value is “$.key” and will result in “Value for THEP-31”. Select the custom field of your choice. The type of the custom field should fit the value type of the previous step. Periodically the data gets synced at least once a day for every issue. New and updated issues get updated immediately by the event system. List fields gets synchronised around every hour but at least every 6 hours. In this section the state of the last synchonisation is displayed. Trigger a new sync with “Start Sync List” and refresh the message below with “Refresh”. Note: Long Field Option lists with hundreds of items takes several minutes the first time they get synced. In this Section you can set an API Token. An API Token is only neccessary when you use list fields to synchronise field options. Due to some limitations of the Atlassian REST Api we have to use a workaround which needs an API Token. After creating an API Token copy and paste it into the form field and save afterwards. Then the App is able to synchrose your field options. 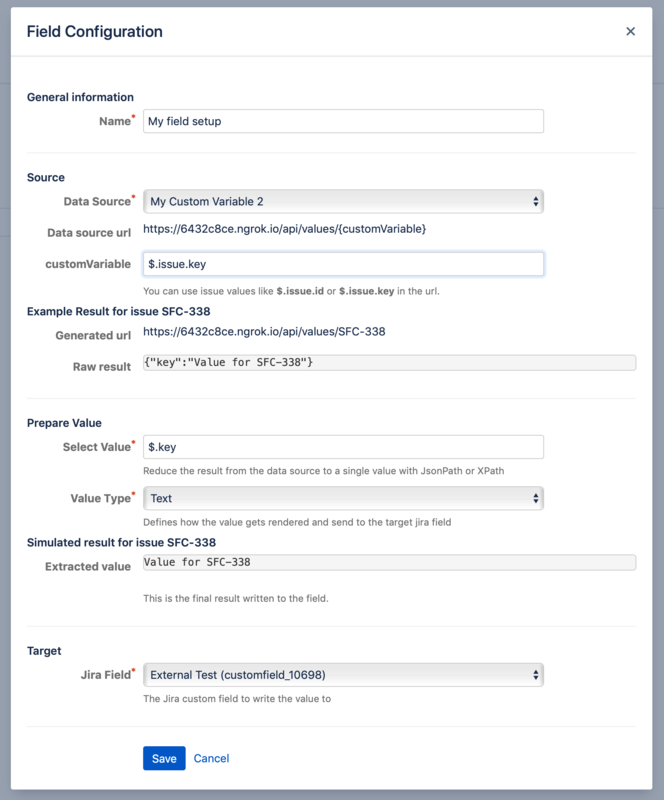 Thanks for using External Data for Jira Fields!